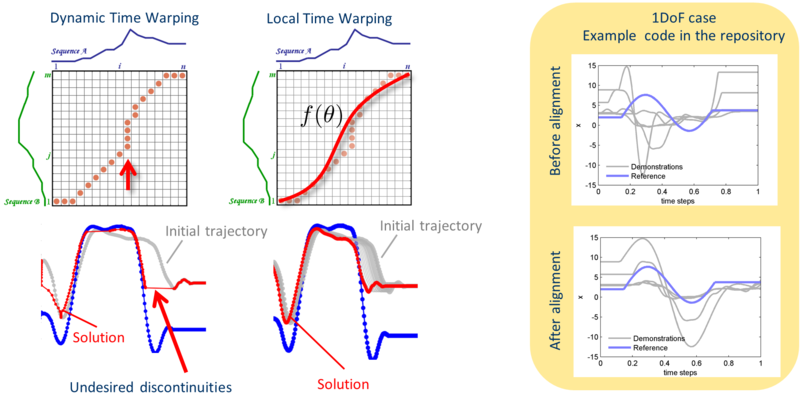 Aligning the phase of the motion of different trajectories to a single reference phase is usually a recurrent problem. This is particularly an issue of probabilistic models that are constructed from multiple demonstrations. Often Dynamic Time Warping (DTW) is used. It provides a global, optimal solution and works pretty well when trajectories are somewhat similar. When trajectories are extremely different DTW tends to generate unnatural solutions, usually caused by having many time indexes of one trajectory being repeated at the other trajectory. Heuristics to avoid this problem were already addressed in the seminal paper of Sakoe and Chiba 1978. This problem is critical for trajectories of dynamical systems and one alternative is to enforce a 1:1 mapping on time indexes. This can be achieved by imposing a smooth function on the time alignment mapping using local optimization. The code in the repo provides this idea implemented in Matlab. There is no free lunch, we trade-off the heuristics of DTW by the usual heuristics of a local optimizer (initial guess, learning rate, and convergence criteria). But in my experience, the usual parameters of an optimizer are much easier to adjust and while covering a wider range of data input. Try it yourself: source code with a short explanation of the method in a pdf document can be found here. If you find the code useful and use it in your work you can cite this paper.